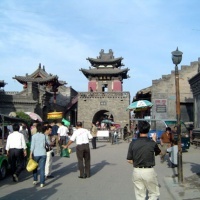 Pingyao Ancient City is a world heritage site near Taiyuan, the capital city of Shanxi. 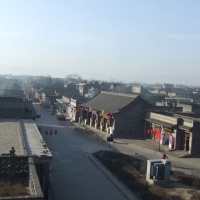 Served as a financial center in central China in the old days, it is noted for the ancient Shanxi merchants, the oldest banks in China, northern Han Chinese culture, architecture, and way of life in the Ming and Qing dynasties. - Qiao Family's Compound: Built in 1756 and located 20 km north of Pingyao, this intact and exquisite structure was once the residence of a powerful trading family with significant commercial influence in China, despite the fact that the Qiao family have ceased to have any influence since the 1940's. The compound was the location of the famous film 'Raise the Red Lantern' directed by Zhang Yimou. - Wang Family's Compound: located on a hilly area, it was the Wang clan's private residence with 54 courtyards and 1,052 rooms for 600 years until the family's decline. The Compound is claimed as "No. 1 civil residence in China" due to its great momentum and complete functions, elegant carvings and decorations, and rich connotation. 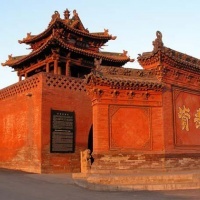 - Zishou Temple: Originally built in the Tang dynasty and rebuilt in the Song, Yuan and Ming dynasties, the temple has a history of more than 1100 years, and it is famous for its graceful colored statues, especially the exquisite statues of the eighteen disciples of Buddha. - The Ancient City Walls: The city walls of Pingyao were first constructed in the Zhou dynasty (827-728 BC) and reconstructed in 1370. The walls have six barbican gates. The north and south sides have one gate each. The east and west sides have two gates each. This pattern is similar to that of a turtle (the head, tail, and four legs), earning Pingyao the moniker "Turtle City." The walls measure about 12 meters high, with a perimeter of 6,163 meters. A 4-meter wide, 4-meter deep moat can be found just outside the walls. Aside from the four structured towers at the four corners, there are also 72 watchtowers and more than 3,000 battlements. - Rishengchang Exchange Shop: Rishengchang lit. “sunrise prosperity.” Originally built in 1823, the shop has 21 buildings surrounding three courtyards. On either side of the front yard are the counters, main banking activities were carried out in the middle courtyard house. The exchange shop is considered the first draft bank in China's history. 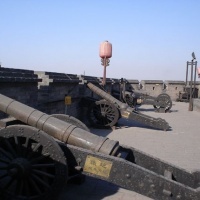 It is now a museum and in 2006 was included on the List of monuments of China. 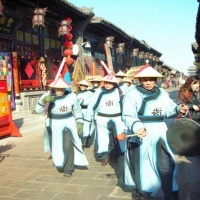 -Ming and Qing Dyansties' Street: The locals call it Nan Da Jie (lit.Southern Big Street). This main downtown thoroughfare is well preserved in the Ming and Qing dynasties' architectural style and considered the optimal place to explore ancient Chinese culture. This bustling street was the local commercial center during the dynastic periods.It still keeps more than 700 ancient shops including the draft banks,money shops,pawnshops,herbal medicine shops,butcher's shops,tabacs,general shops,draper's shops,silk shops and tea shops etc. Its hotels offering traditional brick-oven beds, restaurants serving the local yummy beef and many shops selling a dazzling array of art wares. - Shuanglin Temple: having a history of more than 1500 years, the temple is famous for its 2,502 exquisitely painted clay figurines and statues of Song, Yuan, Ming and Qing dynasties, and is known as "treasure-house of color sculpture arts". Free in the day until your local guide and driver say "Zai Jian" (good-bye) to you at the Pingyao Railway Station.